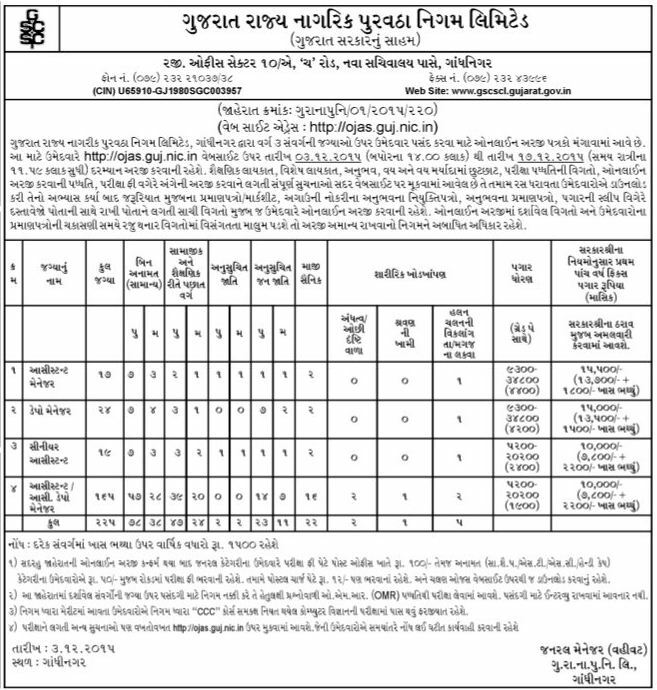 GSCSCL Recruitment 2015 Notification for 225 Assistant Manager, Depot Manager, Senior Assistant and Assistant/Assistant Depot Manager post vacancies was released officially. This is very good news for the candidates who are looking for jobs in Gujarat State Civil Supplies Corporation Ltd., Govt. of Gujarat. Interested candidates who meet the eligibility can apply online for this GSCSCL Recruitment 2015. The official notification and online application available in the official website ojas.guj.nic.in. In our website we have given direct link of Gujarat State Nagrik Purvatha Nigam Bharti 2015-2016 application form. How to Apply: Eligible candidates may apply online form the official website ojas.guj.nic.in form 03-12-2015 to 17-12-2015.